The Denver Broncos, winners of the Super Bowl following the 1997 season, were even stronger in 1998 as they topped the AFC West with a 14-2 record and breezed past the Dolphins and Jets in the playoffs to again earn another conference title. On January 31, 1999 they faced the Atlanta Falcons in Super Bowl XXXIII to defend their crown. Coached by Mike Shanahan for the fourth season, the Broncos had regained the services of 38-year-old star QB John Elway (pictured above) for another year after he had considered retirement in the previous offseason. It was widely anticipated that this would be his finale for sure. RB Terrell Davis was a vital cog in the offense as he rushed for 2008 yards. Wide receivers Rod Smith and Ed McCaffrey both gained over a thousand receiving yards and TE Shannon Sharpe added 64 catches for 768 yards and 10 touchdowns. The NFC Champion Falcons were coached for the second year by Dan Reeves, the longtime mentor in Denver who had led the Broncos to three AFC titles (and as many Super Bowl defeats), and had been forced to leave the club for a time in the late season due to heart bypass surgery. They had also gone 14-2, but were not as highly regarded as the defending champs, having won a close Divisional playoff game against the 49ers and then stunning the Minnesota Vikings in overtime for the NFC title. Atlanta featured a strong running attack led by RB Jamal Anderson (1846 yards) while 33-year-old veteran QB Chris Chandler, often injured and cast aside by five teams thus far in his career, stayed healthy and performed capably with his accurate passing. The opportunistic defense, anchored by MLB Jessie Tuggle, led the league with 44 takeaways and a +20 turnover differential. However, they received a jolt when Pro Bowl FS Eugene Robinson was arrested for soliciting a prostitute the night before the game, providing an unneeded distraction. Still, the Falcons got off to a fast start before 74,803 fans at Miami’s Pro Player Stadium plus the mammoth television audience. Jamal Anderson gained 13 yards on his first carry and, with the help of a pass interference penalty, they reached the Denver eight yard line. However, on third down Chandler was sacked by LB Bill Romanowski for a seven-yard loss and Atlanta settled for a 32-yard Morten Andersen field goal to take the early 3-0 lead. Denver came right back with a scoring drive that was highlighted by an Elway throw to Rod Smith that gained 41 yards on a third-and-seven play. 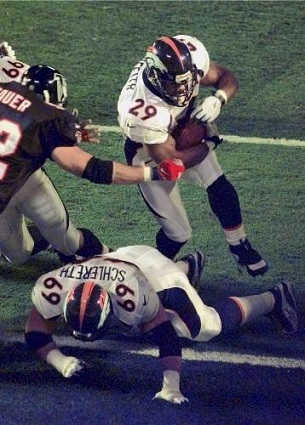 Following a 14-yard Elway completion to Shannon Sharpe, FB Howard Griffith, who only carried the ball four times during the regular season, gained the last yard of the series for a touchdown (pictured below). Late in the opening period, Atlanta got a break when an Elway pass bounced off the hands of Sharpe and was intercepted by CB Ronnie Bradford at the Denver 35. After advancing to the 26, in the first play of the second quarter Anderson was stopped for no gain in a third-and-one situation. Rather than go for the field goal, the Falcons tried to convert the fourth down and Anderson, taking a pitch from Chandler, was thrown for a two-yard loss. Denver proceeded to put together a long 11-play drive that ended with Jason Elam kicking a 26-yard field goal that increased the lead to 10-3. Again the Falcons reached Denver territory in the following series but a field goal try by Morten Andersen from 26 yards flew wide to the right – likely not helped by a high snap from center. On the next play, Elway went deep for Rod Smith who beat Eugene Robinson and went all the way for an 80-yard touchdown. Aided by a 42-yard kickoff return by WR Tim Dwight, Atlanta finally scored again before halftime, but it was a case of settling for a field goal of 28 yards by Andersen and they were down 11 points going into the intermission. The Broncos failed to add to their lead when Elam missed two field goal attempts in the third quarter, from 38 and 48 yards. The first came at the end of the opening series of the second half in which Elway completed four passes in a 13-play possession. The second followed an interception by CB Darrius Johnson that gave the Broncos the ball at the Atlanta 42. The Falcons were unable to capitalize on the missed field goals, although after the second they mounted a drive that carried to the Denver 21 – a touchdown could have put them very much back in the game. However, Chandler’s pass intended for an open TE O.J. Santiago was deflected at the line by DE Keith Traylor and CB Darrien Gordon (pictured below) intercepted and returned it 58 yards before he was brought down by the pursuing quarterback at the Atlanta 24. The Broncos took full advantage of the break as Elway threw to WR Ed McCaffrey for a 15-yard gain and Griffith scored a TD, again from a yard out to start the fourth quarter, expanding Denver’s lead to 24-6. The Falcons once more advanced into Denver territory but, after reaching the 26 yard line, a poorly-thrown pass by Chandler was picked off by Gordon and returned 50 yards to the Atlanta 48. Elway threw short for Terrell Davis, who gained 39 yards, and two plays later Elway ran for a three-yard TD on a quarterback draw that made it 31-6 with 11:20 left in the game. Dwight returned the ensuing kickoff 94 yards for a TD, but the Broncos responded by driving 34 yards in seven plays that concluded with Elam kicking a 37-yard field goal. A long possession yielded one more touchdown for the Falcons, on a three-yard Chandler pass to WR Terance Mathis, which was followed by an unsuccessful two-point conversion attempt as well as an onside kick that the Broncos recovered. With two minutes remaining, however, the result was not in doubt. Denver repeated as NFL Champion by a score of 34-19. The Broncos had the edge in total yards (457 to 337) and first downs (22 to 21). The Falcons turned the ball over four times, however, to one by Denver and all in all did poorly at taking advantage of scoring opportunities. John Elway, the MVP of the game, completed 18 of 29 passes for 336 yards with a touchdown and an interception and also had the short rushing TD. Rod Smith (pictured below) was the receiving star with 5 catches for 152 yards and a TD. 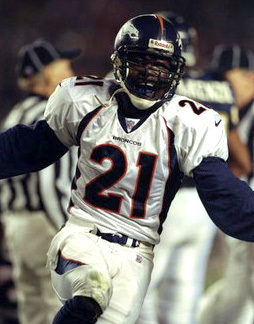 Terrell Davis gained 102 yards on 25 carries and added 50 more yards on two pass receptions. Howard Griffith, who with four rushes matched his total for the entire season, gained just nine yards but had the two short touchdowns. Darrien Gordon’s two interception returns that totaled 108 yards set a Super Bowl record. For the Falcons, Chris Chandler was successful on 19 of 35 throws for 219 yards and a TD but also with three interceptions. Jamal Anderson ran the ball 18 times for 96 yards. Terance Mathis caught 7 passes for 85 yards and a touchdown and WR Tony Martin added 79 yards on 5 receptions. While there was speculation that John Elway would come back once more with the opportunity to win a third straight championship, he did indeed retire. For his 16-season career, he completed 4123 passes for 51,475 yards, which both ranked second all-time at that point, and 300 touchdowns, which ranked third, and was selected to the Pro Bowl on nine occasions. Elway was inducted into the Pro Football Hall of Fame in 2004. With inexperienced Brian Griese at quarterback and Terrell Davis limited to 67 carries due to injury, the Broncos sank to 6-10 in 1999. They did return to the postseason in 2000. Atlanta, with Jamal Anderson also being lost for most of the year due to injury, dropped to 5-11. The Falcons would not post a winning record or make a playoff appearance again until 2002.